The Disciples who sat with Jesus on the Mt. of Olives in Matthew 24:3 asked Him three questions, when shall these things be, what shall be the sign of thy coming, and of the end of the world? These three questions are now revealed to us as the Spirit of God has revealed them to John who told him to write these visions down and give them to the Church for instruction and understanding. Wars and rumor of wars, nation against nation and kingdoms against kingdoms, famines, pestilences and earthquakes are all results of mans sin as they continue to fall from Gods grace as they become lovers of self, 2 Timothy 3:2-4. The fulfillment of prophecy is in that of Jesus life, death and resurrection that we can reconcile ourselves back to God through His grace before the return of Jesus. Our covenant promise from God is that we will have eternal life with Him, John 10:27, 28, through grace that we can reconcile ourselves back to the Father and live our lives according to His will. What you are about to read and have revealed to you in these revelations are those things that are yet future compared with that of the past. It has always been kingdom against kingdom and nation against nation. There are only two kingdoms as one is Gods kingdom that is taught in all truths through Gods Holy Spirit and the other a ruling kingdom of Satan who uses a Jezebel spirit that speaks a deceptive word to deceive the nations, Revelation 2:20. Revelations is full of symbolism that is literal where it needs to be and Spiritual where it needs to define that of the literal. These revelations are given as a warning to those who have yet to accept Jesus as Messiah. Gods chastisements are to draw those back to him in repentance before that door of salvation is closed forever when Jesus returns and Gods true Church is gathered up to be with the Father forever. The focus in Revelations would seem to center around Israel only and the nations that come against her for this is how John would recognize it to be since all other nations were not yet developed in his time. Revelations is about all of us, Jew and Gentile, past, present and future that by faith keep Gods commandments. We are Gods witnesses that testify of His mercy and grace as we take His word out into the world to those who have ears to hear. IS that really 3 questions or one? phrased that way? I would say three questions were asked of the disciples: when, what and the end, as Matthew 24 is an outline of Revelations which shows us those things that have to come first before Christ returns. Have those things that are prophesied happened across history? Maybe the reason God referred to the culmination of actions and righteous God's re-action as the end of days is not because it will culminate in the end of the world but rather, the end of a given age. So that when humanity picks up the pieces they have a chance to start again having learned their lesson from their past mistakes. History does repeat itself with the same types of players being involved until an end of all things is made final. .......... and as soon as you determine what "end" was being spoken of, then you just might start understanding The Revelation. Revelations is full of symbolism that is literal where it needs to be and Spiritual where it needs to define that of the literal. Something cannot be literal and symbolic at the same time. You need to explain what you mean by symbolism being spiritual where it needs to define that of the literal. Revelation contains John's attempt to put into human language his apocalyptic, ecstatic visions. The challenge is that it is impossible to accurately describe such visions in human language. All he can do is describe the vision in the manner that someone might describe a very confused dream. Jesus does a better job of answering the three questions at Mat 24 than John does in Revelation. Jesus answers are intentionally vague but they are not as enigmatic as the ecstatic, apocalyptic visions of the Revelation. (3) (what shall be the sign) of the end of the world? The Roman General Titus set up a statue of himself in the Holy of Holies before he destroyed the temple leaving not one stone upon another. (2) False Christs and prophets will arise and perform great wonders. As lightning lights the whole night sky, so will be the coming of Christ. Everybody will see it. (3) The sign of the Son of Man will appear in heaven, and then all the tribes of the earth will mourn, and they will see the Son of Man coming on the clouds of heaven with power and great glory and He will send His angels with a great sound of a trumpet, and they will gather together His elect from the four winds, from one end of heaven to the other. Does anyone understand that Revelation is not full of random symbolism? Almost all of it is taken from, and relates directly back to, the OT where it is clearly written out. Sorry I can not comment on your videos as I'm on dial up and can not open them. Did the Israelites learn their lesson after being held captive by Babylon, no. Israel lost her right to be called Gods chosen people, (God did save a faithful remnant), as they fell into idolatry worshipping other gods as they allowed themselves to fall from Gods grace as they followed the lust of their own hearts as they practiced Judaism, 1Kings 9:1-9. God’s judgment against them led them to be captured, 605 – 537 B.C., by Nebuchadnezzar and taken into Babylon for seventy years while Nebuchadnezzar’s army killed many Jews in Judah and Jerusalem destroying the whole city of Jerusalem including the first Temple that was built through King Solomon’s reign in Jerusalem. God gave Israel 490 years to repent. They were set free from Babylon when the Medes and Persian conquered Babylon (Chaldean's) around 538 B.C. They were allowed back in the land and to rebuild the city of Jerusalem, however, they still did not repent for their sin of idol worshipping and they continued to receive punishment from God as the kingdom was taken away and eventually taken over by the Roman Empire. Malachi Chapter 1-4. This is when the end will come when the gospel is preached to everyone. Rev is written on spiritual truths come from the Spiritual realm of God and historical realities of the OT like Babylon and mystery Babylon. Ten horns and little horn. The beast out of the sea and out of the earth. Revelation was given to John in visions as prophecies that had their beginnings in the Old Testament, being fulfilled in the New Testament and yet much to be fulfilled in future events before the great and terrible day of the Lords return. Spiritual symbolism is used in description like that of the seven candlesticks and that which stood in the midst of it, Rev 1:12-16, and what Jesus looks like in Rev 19:11-16, but yet not literally, but symbolically. The Male-child – Jesus (Rev. 12). Thank God! So many people try their best to make it a Science Fiction movie script. How do you square that with the Bible saying that the gospel had already been preached to all the world long ago? Can you show me where it says that the gospel has already been preached to all the world, Thank you Willie. I tried copying and pasting this in a quote for you, but it exceeds like 100,000 words I think or maybe it was 10,000? So I will leave the link here to the information discussed in the video. I hope you’ll be able to read it when you get the chance. I honestly believe that this link is better actually. 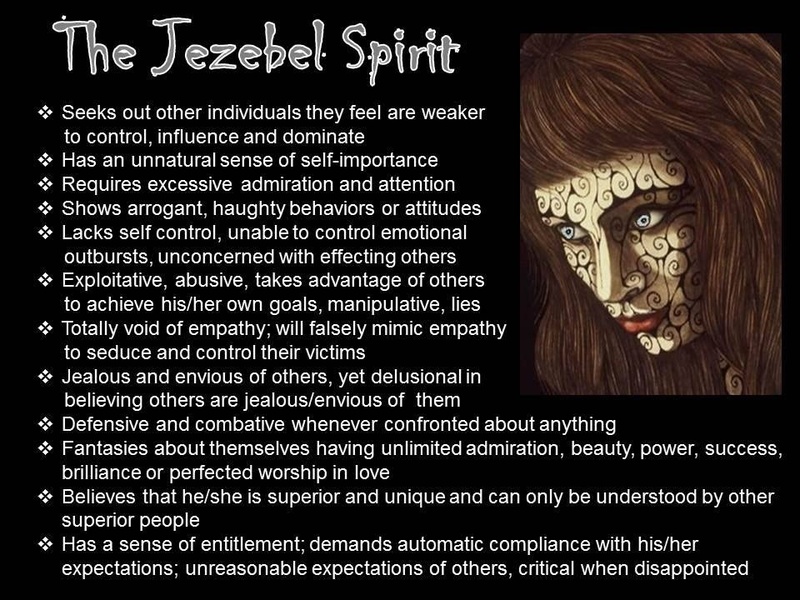 30 Traits of The Jezebel Spirit.